© 2015 by Nalo Hopkinson and Nisi Shawl. Originally published in Stories for Chip, edited by Nisi Shawl and Bill Campbell. Reprinted by permission of the authors. Plaquette let herself in through the showroom door of the watchmaker’s that morning to hear Msieur blistering the air of his shop with his swearing. The hulking clockwork man he’d been working on was high-stepping around the workroom floor in a clumsy lurch. It lifted its knees comically high, its body listing to one side and its feet coming down in the wrong order; toe, then heel. Billy Sumach, who delivered supplies to Msieur, was in the workroom. Through the open doorway he threw her a merry glance with his pretty brown eyes, but he had better sense than to laugh at Msieur’s handiwork with Msieur in the room. Plaquette winced. Their family needed every cent of her earnings, but she’d had to wait home till Ma got back from the railroad to take over minding Pa.
As though Plaquette didn’t know that. “Yes, Msieur,” she said to his back as he stormed through the door to the showroom. “Just help me get this George to its feet. It weighs a ton.” Billy was a fine man, of Plaquette’s color and station. Lately when he came by with deliveries he’d been favoring her with smiles and wistful looks. But she couldn’t study that right now, not with Pa taken so poorly. Together they wrestled the George over to Plaquette’s work table. There it stood. Its painted-on porter’s uniform had chipped at one shoulder when it fell. Its chest door hung open as a coffin lid. Plaquette wanted to weep at the tangle of metal inside it. She’d taken the George’s chest apart and put it back together, felt like a million times now. Msieur couldn’t see what was wrong, and neither could she. Its arms worked just fine; Plaquette had strung the wires inside them herself. But the legs . . .
Plaquette nodded again. She wouldn’t have felt right saying yes to courting, anyway. Not with Pa so sick. If he’d asked, that is. “Billy, you ever think of doing something else?” The words were out before she knew she wanted to ask them. “Not some big city far off?” She wondered how Billy’s calloused hands would feel against her cheek. Billy collected Msieur’s shoe, then ducked into the showroom. Plaquette hung her hat on the hook near the back and sat down to work. Msieur’s design for the George lay crumpled on her table where he’d left it. She smoothed out the sheets of paper and set to poring over them, as she’d done every day since she started working on the George. This was the most intricate device Msieur had ever attempted. It had to perform flawlessly on the day the governor unveiled it at the railroad. For a couple years now, Msieur had depended on Plaquette’s keen vision and small, deft hands to assemble the components of his more intricate timepieces and his designs. By the point he decided to teach her how to read his notes, she’d already figured out how to decipher most of the symbols and his chicken scratch writing. There. That contact strip would never sit right, not lying flat like that. Needed a slight bend to it. Plaquette got a pencil out of her table’s drawer and made a correction to Msieur’s notes. Billy came back and started to bring boxes from his cart outside in through the workroom door. While he worked and tried to make small talk with her, Plaquette got herself a tray. From the drawers of the massive oak watchmaker’s cabinet in the middle of the shop, she collected the items she needed and took them to her bench. “Might rain Saturday, don’t you think?” huffed Billy as he heaved a box to the very top of the pile. “Might,” Plaquette replied. “Might not.” His new bashfulness with her made her bashful in return. They couldn’t quite seem to be companionable any more. She did a last check of the long row of black velvet cloth on her workbench, hundreds of tiny brass and crystal components gleaming against the black fur of the fabric. She knew down to the last how many cogs, cams, and screws were there. She had to. Msieur counted every penny, fussed over every quarter inch of the fine gauge wire that went into the timekeepers his shop produced. At year’s end he tallied every watch finding, every scrap of leather. If any were missing, the cost was docked from her salary. Kind of the backwards of a Christmas bonus. As if Msieur didn’t each evening collect sufficient profits from his till and lower them into his “secret” safe. Billy saw Plaquette pick up her tweezers and turn towards the mechanical porter. “Do you want Claude?” he asked her. He knew her so well. She smiled at him. “Yes, please.” He leapt to go fetch Claude out of the broom closet where they stored him. Billy really was sweet, and he wasn’t the only one who’d begun looking at her differently as she filled out from girl to woman this past year. Ma said she had two choices: Marry Billy and be poor but in love, or angle to become Msieur’s placée and take up life in the Quarter. Msieur would never publicly acknowledge her or any children he had by her, but she would be comfortable, and maybe pass some of her comforts along to Ma and Pa. Not that they would ever ask. ’Sides, she wasn’t even sure she was ready to be thinking about all that bother just yet. Plaquette yawned. She was bone tired, and no wonder. She’d been spending her nights and Sundays looking after Pa since he had come down with the jake leg. Claude’s books had excited Plaquette when she first heard them, but in time they’d become overly familiar. She knew every thrilling leap from crumbling clifftops, every graveside confession, every switched and secret identity that formed part of those well-worn tales. They had started to grate on her, those stories of people out in the world, having adventures she never could. Pa got to see foreign places; the likes of New York and Chicago and San Francisco. He only passed through them, of course. He had to remain on the train. But he got to see new passengers at each stop, to smell foreign air, to look up into a different sky. Or he had. He would again, when he got better. He would. The metal Georges would need minding, wouldn’t they? And who better for that job than Pa, who’d been a dependable George himself these many years? But for Plaquette, there was only day after day, one marching in sequence behind another, in this workroom. Stringing tiny, shiny pieces of metal together. Making shift nowadays to always be on the other side of the room from Msieur whenever he was present. She was no longer the board-flat young girl she’d been when she first went to work for Msieur. She’d begun to bud, and Msieur seemed inclined to pluck himself a tender placée flower to grace his lapel. A left-handed marriage was one thing, but to a skinflint like Msieur? Problems crowding up on each other like storm clouds running ahead of the wind. Massing so thick that Plaquette couldn’t presently see her way through them. Ma said when life got dark like that, all’s you could do was keep putting one foot in front the other and hope you walked yourself to somewhere brighter. But as usual, once Billy set Claude up and the automaton began its recitation, her work was accurate and quick. She loved the challenge and ritual of assemblage: laying exactly the right findings out on the cloth; listening to the clicking sound of Claude’s gears as he recited one of his scrolls; letting the ordered measure take her thoughts away till all that was left was the precise dance of her fingers as they selected the watch parts and clicked, screwed, or pinned them into place. Sometimes she only woke from her trance of time, rhythm, and words when Msieur shook her by the shoulder come evening and she looked up to realize the whole day had gone by. Shadows fell on Plaquette’s hands, obscuring her work. She looked around, blinking. When had it gone dusk? The workroom was empty. Billy had probably gone on about his other business hours ago. Claude’s scroll had run out and he’d long since fallen silent. Why hadn’t Msieur told her it was time to go? She could hear him wandering around his upstairs apartment. She rubbed her burning eyes. He’d probably hoped she’d keep working until the mechanical George was set to rights. Had she done it? She slid her hands out of the wire-and-cam guts of the mechanical man. She’d have to test him to be sure. But in the growing dark, she could scarcely make out the contacts in the George’s body that needed to be tripped in order to set it in motion. She took a few steps in the direction of the Carcel. Plaquette gasped and dashed for the showroom door to the street. She had grabbed the latch rope before her wits returned. She let the rope go and faced back toward the black doorway out of which emerged the automaton, Claude. It rocked forward on its treads, left side, right. Its black velvet jacket swallowed what little light there still was. But the old-fashioned white ruff circling its neck cast up enough brightness to show its immobile features. They had, like hers, much of the African to them. Claude came to a stop in front of her. Plaquette giggled. “You giving me a good reminder—I better put that oil on your wheels as well as your insides. You like to scare me half to death rolling round the dark in here.” She pulled the miniature oil tin from her apron pocket and knelt to lubricate the wheels of the rolling treads under Claude’s platform. It had been Plaquette’s idea to install them to replace the big brass wheels he’d had on either side. She’d grown weary of righting Claude every time he rolled over an uneven surface and toppled. It had been good practice, though, for nowadays, when Pa was like to fall with each spastic step he took, and Plaquette so often had to catch him. He hated using the crutches. And all of this because he’d begun taking a few sips of jake to warm his cold bones before his early morning shifts. Jamaica Ginger was doing her family in, that was sure. Quickly, Plaquette stopped the automaton midsentence. For good measure, she removed the book from its spool inside Claude. She didn’t want Msieur to hear that she was still downstairs, alone in the dark. As Plaquette straightened again, a new thought struck her. The shutters folded back easily. White light from the coil-powered street lamp outside flooded the tick-tocking showroom, glittering on glass cases and gold and brass watches, on polished wooden housings and numbered faces like pearly moons. More than enough illumination for Plaquette’s bright eyes. “Come along, Claude,” Plaquette commanded as she headed back towards the workroom—somewhat unnecessarily, as she had Claude’s wardenclyffe in the pocket of her leather work apron. Where it went, Claude was bound to follow. Which made it doubly foolish of her to have been startled by him. She could see the mechanical porter more clearly now, its cold steel body painted deep blue in imitation of a porter’s uniform, down to the gold stripes at the cuffs of the jacket. Its perpetually smiling black face. The Pullman Porter “cap” atop its head screwed on like a bottle top. Inside it was the Tesla receiver the George would use to guide itself around inside the sleeping-car cabins the Pullman company planned to outfit with wireless transmitters. That part had been Plaquette’s idea. Msieur had grumbled, but Plaquette could see him mentally adding up the profits this venture could bring him. If Msieur’s George was a success, that’d be the end of her father’s job. Human porters had human needs. A mechanical George would rarely be ill, never miss work. Would always smile, would never need a new uniform—just the occasional paint touch-up. Would need to be paid for initially, but never paid thereafter. With two fingers, Plaquette poked the George’s ungiving chest. The mechanical man didn’t so much as rock on its sturdy legs. Plaquette still thought treads would have been better, like Claude’s. But Msieur wanted the new Georges to be as lifelike as possible, so as not to scare the fine ladies and gentlemen who rode the luxury sleeping-cars. So the Georges must be able to walk. Smoothly, like Pa used to. The chiming clocks in the showroom began tolling the hour, each in their separate tones. Plaquette gasped. Though surrounded by clocks, she had completely forgotten how late it was. Ma would be waiting for her; it was nearly time for Pa’s shift at the station! She couldn’t stop now to test the George. She slapped Claude’s wardenclyffe into his perpetually outstretched hand, pulled her bonnet onto her head, and hastened outside, stopping only to jiggle the shop’s door by its polished handle to make sure the latch had safely caught. Plaquette went into the dark apartment. No fancy lights for them. Ma had left the kerosene lamp on the kitchen table, turned down low. Plaquette could see through to Ma and Pa’s bed. Pa was tucked in tight, only his head showing above the covers. He was breathing heavy, not quite a snore. The shape of him underneath the coverlet looked so small. Had he shrunk, or was she growing? Plaquette hung up her hat. In her hurry to get home, she’d left Msieur’s still wearing her leather apron. As she pulled it off to hang it beside her hat, something inside one of the pockets thumped dully against the wall. One of Claude’s book scrolls; the one she’d taken from him. She returned it to the pocket. Claude could have it back tomorrow. She poured herself some soup from the pot on the stove. Smelled like pea soup and crawfish, with a smoky hint of ham. Ma had been stretching the food with peas, seasoning it with paper-thin shavings from that one ham shank for what seemed like weeks now. Plaquette didn’t think she could stomach the taste of more peas, more stingy wisps of ham. What she wouldn’t give for a good slice of roast beef, hot from the oven, its fat glistening on the plate. “If I do, you gotta tell me ’bout San Francisco again.” She sat on the bed facing him, knees drawn up beneath her skirts like a little child. Pa’s eyes grew round. The lines in his face smoothed out as Plaquette spun her story. A cruel prince. A fearsome army. A lieutenant with a conscience. It would have to be Msieur. That ended up being a good night. Pa fell back to sleep, his face more peaceful than she’d seen in days. Plaquette curled up against his side. She was used to his snoring and the heaviness of his drugged breath. She meant to sleep there beside him, but her mind wouldn’t let her rest. It was full of imaginings: dancing with Msieur at the Orleans Ballroom, her wearing a fine gown and a fixed, automaton smile; Billy’s hopeful glances and small kindnesses, his endearingly nervous bad jokes; and Billy’s shoulders, already bowed at seventeen from lifting and hauling too-heavy boxes day in, day out, tick, tock, forever (how long before her eyesight went from squinting at tiny watch parts? ); an army of tireless metal Georges, more each day, replacing the fleshly porters, and brought about in part by her cleverness. Whichever path her future took, Plaquette could only see disaster. Yet in the air above her visions, They flew. Finally Plaquette eased herself out of bed. The apartment was dark; she’d long since blown out the lamp to save wick and oil. She tiptoed carefully to the kitchen. By feel, she got Claude’s reading scroll out of the pocket of her apron. She crept out onto the landing. By the light of a streetlamp, she unrolled and re-rolled it so that she could see the end of the book. The punched holes stopped a good foot-and-a-half before the end of the roll. There was that much blank space left. Plaquette knew My Lady Nobody practically word for word. She studied the roll, figuring out the patterns of holes that created the sounds which allowed Claude to speak the syllables of the story. She could do this. She crept back inside and felt her way through the kitchen drawer. She grasped something way at the back. A bottle, closed tight, some liquid still sloshing around inside it. A sniff of the lid told her what it was. She put the bottle aside and kept rummaging through the drawer. Her heart beat triple-time when she found what she was looking for. Pa did indeed have more than one ticket punch. It was as though there was a fever rising in her; for the next few hours she crouched shivering on the landing and in a frenzy, punched a complicated pattern into the end of the scroll, stopping every so often to roll it back to the beginning for guidance on how to punch a particular syllable. By the time she’d used up the rest of the roll, her fingers were numb with cold, her teeth chattering, the sky was going pink in the east, and the landing was scattered with little circles of white card. But her brain finally felt at peace. She rose stiffly to her feet. A light breeze began blowing the white circles away. Ma would probably be home in another hour or so. Plaquette replaced the scroll in her apron pocket, changed into her nightgown, and lay back down beside her father. In seconds, she fell into a deep, dreamless sleep. Ma woke her all too soon. Plaquette’s eyes felt like there was grit in them. Pa was still snoring away. Ma gestured her out to the kitchen, where they could speak without waking him. Ma’s face was drawn with fatigue. She’d spent the night fetching and carrying for white people. “How he doing?” she asked. Plaquette felt her eyebrows lift in surprise. The Pa she knew washed every morning and night and had a full bath on Sundays. It was one weight too many on the scales. Plaquette feared it would tip her completely over. She stammered, “I-I have to-to go, Ma.” Blindly, she grabbed her bonnet and apron and sped out the door. Guilt followed her the whole way to Msieur’s. Leaving Ma like that. She would have to start charming Msieur, sooner rather than later. Plaquette was the first one to the shop, just as she’d planned it. Msieur generally lingered over his breakfast, came down in time to open the showroom to custom. She’d have a few minutes to herself. She’d make it up to Ma later. Sit down with her and Pa Sunday morning and work out a plan. Claude and the George were beside her bench, right where she’d left them. She bent and patted Claude on the cheek. She delved into Claude’s base through its open hatch and removed the remaining three “books” which Claude recited when the rolls of punched paper were fed into his von Kempelen apparatus. Claude bided open and silent, waiting to be filled with words. Eagerly Plaquette lowered her book onto the spool and locked that in place, then threaded the end—no, the beginning, the very beginning of this new story—onto the toothed drum of the von Kempelen and closed its cover. She removed the ribbon bearing Claude’s key from his wrist. She wound him tight and released the guard halfway—for some of the automaton’s mechanisms were purely for show. In this mode, Claude’s carven lips would remain unmoving. Afire with the joy of it, Plaquette began working on the George again. But come noon the metal man was still as jake-legged as Pa. Seemed there was nothing Plaquette could do to fix either one. She tried to settle her thoughts. She couldn’t work if her mind was troubled. She’d listened to her punchcard story three times today already. She knew she was being vain, but she purely loved hearing her words issue forth from Claude. The story was a creation that was completely hers, not built on the carcass of someone else’s ingenuity. Last night’s sleepless frenzy had cut the bonds on her imagination. She’d set free something she didn’t know she had in her. Claude’s other novels were all rich folk weeping over rich folk problems, white folk pitching woo. They Fly at Çironia was different, wickedly so. The sweep and swoop of it. The crudeness, the brutality. She wound the key set into Claude’s side until it was just tight enough, and tripped the release fully. With a quiet sound like paper riffling, Claude’s head started to move. His eyelids flicked up and down. His head turned left to right. The punchcard clicked forward one turn. Claude’s jaw opened, and he began to recite. “Now,” she whispered to the George, “one more time. Let’s see what’s to be done with you.” She reached into his chest with her tweezers as the familiar enchantment began to come upon her. While the Winged Ones screeed through the air of Çironia’s mountains on pinions of quartz, Plaquette wove and balanced quiltings of coiled springs, hooked them into layer upon layer of delicately-weighted controls, dropped them into one another’s curving grasps, adjusted and readjusted the workings of the George’s legs. Finally, for the fourth time that day, the Winged Ones seized the story’s teller and tossed him among themselves in play. Finally, for the fourth time that day, he picked himself up from the ground, gathered about himself such selfness as he could. The short book ended. Gradually Plaquette’s trance did the same. Except for the automatons, she was alone. The time was earlier than it had been last night. Not by much. Shadows filled the wide corners, and the little light that fell between buildings to slip in at the tall windows was thin and nearly useless. A creaking board revealed Msieur’s presence in the showroom just before the door communicating with it opened. He stuck his head through, smiling like the overdressed man Plaquette had run from on her way home last night. She returned the smile, trying for winsomeness. “Not taking ill, are you?” Msieur asked. So much for her winning ways. He moved forward into the room to examine the George. “Have you finished for the day? I doubt you made much progress.” His manicured hands reopened the chest she had just shut. He bent as if to peer inside, but his eyes slid sideways, towards Plaquette’s bosom and shoulders. She should stand proud to show off her figure. Instead, she stumbled up from her bench and edged behind the stolid protection of Claude’s metal body. Smiling more broadly yet, Msieur turned his gaze to the George’s innards in reality. “You do appear to have done something, however—Let’s test it!” He closed up the chest access. He retrieved the mechanism’s key from the table, wound it tight, and tripped its initial release. The George lumbered clumsily to its feet. “Where’s that instruction card? Ah!” Msieur inserted it and pressed the secondary release button. Then it stuck in place. Quivering punctuated by rhythmic jerks ran along its blue-painted frame. Rrrr-rap! Rrrr-rap! RRRR-RAP! With each repetition the noise of the George’s faulty operation grew louder. Msieur ran quickly to disengage its power. By “we,” Msieur meant her. He expected for her to toil on his commission all night. His face brightened. “Yes? Your own place in the Quarter. You would keep working in the shop, of course. Splendid, then. Splendid.” He winked at her! The door to the showroom slammed shut. The jangle of keys told Plaquette that Msieur had locked her in. Like a faint echo, the door to the street slammed seconds later. She sank back onto her seat. Only greyness, like dirty water, trickled in at the workroom windows, fading as she watched. So even if she became Msieur’s placée, tended to their left-hand marriage, he would expect her to continue in this dreary workroom. Plaquette frowned, attempting to recall if she’d heard the grate and clank of the safe’s door closing on the day’s proceeds, the money and precious jewels Msieur usually hid away there. Sometimes she could remember what had happened around her during the last few minutes of her trance. Only the vague outlines of its windows broke the darkening workroom’s walls. And beneath where she knew the showroom door stood, a faint, blurry smear gleamed dully, vanishing remnant of l’heure bleue. She must go home now. Before Msieur returned with his chocolate pie and his unctuous wooing. She considered the showroom door a moment longer. But the door from there led right to the street. People would be bound to see her escape. The workroom door, then; the delivery entrance that led to the alleyway. She twisted to face it. Msieur had reinforced this door the same summer when, frightened of robbers, he sank his iron safe beneath the workroom’s huge oak cabinet. It was faced outside with bricks, a feeble attempt at concealment that made it heavy—too heavy for Plaquette alone to budge. Plaquette, however, was not alone. Marshaling the George into position, she set him to kick down the thick workroom door. The George walked forward a few more feet, then stopped there in the alley, lacking for further commands. A dumb mechanical porter with no more sense than a headless chicken. Though she hadn’t planned it, Plaquette found she knew what she wanted to do next. She rushed back to her bench. Claude cheerfully rocked after her. She erased all the corrections that she’d meticulously made to Msieur’s notes. She scribbled in new ones, any nonsense that came to mind. Without her calculations Msieur would never work out the science of making a wireless iron George. Someone else eventually might, but this way, it wouldn’t be on Plaquette’s conscience. She took a chair with her out into the alleyway, climbed up onto it, and unscrewed the George’s cap. She upturned it so that it sat like a bowl on the George’s empty head. From her apron she produced the bottle she’d taken from Ma’s kitchen; the one with the dregs of jake in it. Ma could never bear to throw anything away, even poison. Plaquette poured the remaining jake all over the receiver inside the George’s cap. There was a satisfying sizzling sound of wires burning out. Jake leg this, you son of a—well. Ma wouldn’t like her even thinking such language. She screwed the cap back onto the George’s head. Msieur might never discover the sabotage. One more trip back inside the workroom, to Claude’s broom closet. On a hook in there hung the Pullman porter’s uniform that Msieur had been given to model the George’s painted costume after. It was a men’s small. A little large on her, but she belted in the waist and rolled up the trouser hems. She slid her hands into the trouser pockets, and exclaimed in delight. So much room! Not dainty, feminine pockets—bigger even than those stitched onto her workroom apron. She could carry almost anything she pleased in these! But now she really must hurry. She strewed her clothing about the workroom—let Msieur make of that what he would. A kidnapping or worse, her virgin innocence soiled, maybe her lifeless body dumped in the bayou. And off they went—Plaquette striding freely in her masculine get-up, one foot in front of the other, making her plan as she made up the stories she told Pa: by letting the elements come to her in the moment. Claude rolled in her wake, tipping dangerously forward as he negotiated the steep drop from banquette to roadway, falling farther and farther behind. When they came to the stairs up the side of the building where she lived she was stumped for what to do. Claude was not the climbing sort. For the moment she decided to store him in the necessary—she’d figure out how to get him back to Msieur’s later. She’d miss his cheerful face, though. Ma yelped when a stranger in a porter’s uniform walked in the door. She reached for her rolling pin. “Ma! It just me!” Plaquette pulled off her cap, let her hair bush out free from under it. Except she was! Till now, Plaquette hadn’t thought it through. But that’s exactly what she was going to do. Plaquette thought fast. “Not Pa. Pa’s replacement.” She pulled herself up to her full height. “Pleased to introduce you to Mule Aranslyde, namely myself. Ol’ Pullman’s newest employee.” She sketched a mock bow. Pa cackled in delight. A little plate of peas and greens and ham fat had been set aside for her. Plaquette spooned it down while Ma went on about how Plaquette must have lost her everlovin’ mind and Pa wasn’t helping with his nonsense. Then Plaquette took a still protesting Ma by the hand and led her into the bedroom. “Time’s running short,” she said. “Lemme tell y’all why I need to go.” That brought a bit more commotion, though she didn’t even tell them the half of it. Just the bit about the George. And she maybe said she’d broken it by accident. Plaquette took Ma’s two hands in her own. “I’m a ’prentice, remember?” She patted the letter in her breast pocket that Pa had dictated to her, the one telling Pa’s porter friend Jonas Jones who she was and to look out for her and thank you God bless you. She kissed Pa goodbye. Ma walked her out onto the landing, and that’s when Plaquette’s plan began to go sideways. There at the foot of the stairs was Claude, backing up and ramming himself repeatedly into the bottom stair. Plaquette had forgotten she had Claude’s wardenclyffe in her pocket. All this time he’d been trying to follow it. “Plaquette,” said Ma, “what for you steal Msieur’s machine?” It wasn’t a shout but a low, scared, angry murmur—far worse. In the lamplight scattered into the yard from the main street, Claude’s white-gloved hands glowed eerily. Plaquette clattered down the stairs to confront the problem. “I know you think he yours, but girl, he don’t belong to you!” Ma had come down behind her. Plaquette didn’t even need to turn to know the way Ma was looking at her: hard as brass and twice as sharp. “I—I set him to follow me.” Plaquette faltered for words. This was the part she hadn’t told them. “Stop! Stop! Thief!” Angry as she’d feared, Msieur’s shout came from behind them. It froze her one long awful second before she could run. Ahead Ma shoved past a fat man in woolens and sent him staggering to the right. Behind them came more exclamations, more men calling for them to halt, their cries mixed with the shrieks and swearing of the people they knocked aside. How’d he know where to look for her? Trust a man whose business was numbers to put two and two together. Msieur had friends with him—How many? Plaquette barely glanced back. Two? Four? No telling—she had to run to stay in front of Claude so he’d follow her to—an opening! She broke away from the thick-packed travelers and ran after Ma to a long brick walk between two puffing engines. Good. Cover. This must be why Ma had taken such an unexpected path. Swaying like a drunk in a hurricane, Claude in his crate lumbered after her. The noise of their pursuers fell to a murmur. Maybe she’d lost them? “B-but you came this w-w-ay!” Plaquette stammered. One of the dark train carriages Plaquette had run past had been split up the middle—hadn’t it? A deeper darkness—a partially open door? Spinning, she rushed back the way they’d come. Yes! “Ma!” Plaquette pushed the sliding door hard as she could. It barely budged. Was that wide enough? She jumped and grabbed its handle and swung herself inside. But Claude! Prisoned in slats, weighed down by his treads, he bumped disconsolately against the baggage car’s high bottom. Following her and the wardenclyffe, exactly as programmed. Should she drop it? She dug through the deep pockets frantically and pulled it out so fast it flew from her hand and landed clattering somewhere in the carriage’s impenetrable darkness. Hidden like she wished she could hide from the hoarsely shouting men. But they sounded frustrated as well as angry now, and no nearer. Maybe the engine on the track next to this was in their way? The train began moving. From Plaquette’s perch it looked like the bricks and walkway rolled off behind her. Claude kept futile pace. The train was pulling up alongside Ma, standing hopelessly where Plaquette had left her, waiting to be caught. Now she was even with them. Plaquette brushed her fingers over Ma’s yellow headscarf. It fell out of reach. “Goodbye, Ma! Just walk away from Claude! They won’t know it was you!” Fact was, Plaquette felt excited almost as much as she was scared. Even if Msieur got past whatever barrier kept them apart right now, she was having her adventure! The train stopped. Plaquette’s heart just about did, too. Her only adventure would be jail. How could she help Ma and Pa from inside the pokey? She scanned the walkway for Msieur and his friends, coming to demand justice. But no one showed. The shouts for her and Ma to stop grew fainter. The train started again, more slowly. Suddenly Ma was there, yanking Claude desperately by his cord. She’d pulled his crate off. It was on the platform, slowly disappearing into the distance. Together, Ma and Plaquette lifted Claude like he was luggage, tilting him to scrape over the carriage’s narrow threshold. As they did, the tray holding the books caught on the edge and was dragged open—and it held more than book scrolls. Cool metallic disks, crisp or greasy slips of paper—Msieur’s money! How? Plaquette wasted a precious moment wondering—he must have put the day’s take into Claude when she surprised him in the showroom. Ma’s eyes got wide as saucers. She was still running to keep up, puffing as she hefted Claude’s weight. With a heave, she and Plaquette hauled him into the car. He landed with a heavy thump. The train was speeding up. There was no time to count it; Plaquette fisted up two handsful of the money, coins and bills both, and shoved it into Ma’s hands. Surely it was enough to suffice Ma and Pa for a while. “I’ll come back,” she said. The train kept going, building speed. Ma stopped running. She was falling behind fast. “You a good girl!” she yelled. When it seemed sure the train wasn’t stopping again anytime soon, Plaquette stuck her head out—a risk. A yellow gleam in the shadows was all she could see of Ma. Plaquette shoved the sliding door closed. Well. She’d gone and done it now. Pa’s note was no use; this wasn’t the train making the Frisco run. It for sure wasn’t no sleeping-car train. A porter had no business here. The train could be going to the next town, or into the middle of next week. She had no way of knowing right now. For some reason, that made her smile. She fumbled her way to Claude’s open drawer. The money left in there was all coins, more than she could hold in one hand. She divided it amongst the deep, deep pockets in her trousers and jacket. She was a true and actual thief, and a saboteur. Finally she found the wardenclyffe. Feeling farther around her in the loud blackness, she determined the carriage was loaded as she’d imagined with trunks, suitcases, parcels of all shapes and sizes. Nothing comfortable as the beds at home, the big one or the little. She didn’t care. When the train stopped, she’d count the money. When the train stopped, she’d calculate what to do, where to go, how to get by. She could slip off anywhere, buy herself new clothes, become a new person. She settled herself as well as she could on a huge, well-stuffed suitcase and closed her eyes. Claude would help. She would punch more books for him to read and collect from the people who came to listen. Send money home to Pa and Ma every few weeks. She’d write the books herself. She’d get him to punch them. She’d punch a set of instructions for how to punch instructions for punching. She’d punch another set of instructions and let Claude write books, too. And maybe come back one day soon. Find Billy. Take him away and show him a new life. The train ran toward the north on shining steel rails. Plaquette’s dreams flew toward the future on pinions of shining bright ideas. 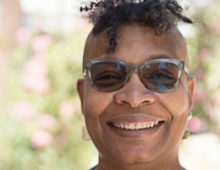 Nalo Hopkinson was born in Jamaica, and grew up in Guyana, Trinidad, and Canada. Her debut novel, Brown Girl in the Ring was the winning entry in the Warner Aspect First Novel contest, and led to her winning the Campbell Award for Best New Writer. She has since published many acclaimed novels and short stories as well as numerous essays. She currently teaches writing at the University of California, Riverside. Her latest novel is Sister Mine. 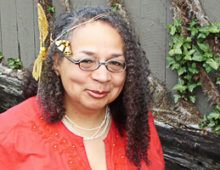 Nisi Shawl’s collection Filter House was a 2009 James Tiptree, Jr., Award winner; her stories have been published at Strange Horizons, in Asimov’s SF Magazine, and in anthologies including The Year’s Best Fantasy and Horror and both volumes of the Dark Matter series. She was the 2011 Guest of Honor at the feminist SF convention WisCon and a 2014 co-Guest of Honor for the Science Fiction Research Association. She co-authored the renowned Writing the Other: A Practical Approach with Cynthia Ward, and co-edited the nonfiction anthology Strange Matings: Science Fiction, Feminism, African American Voices, and Octavia E. Butler. Shawl’s Belgian Congo steampunk novel Everfair came out in 2016 from Tor Books. Her website is nisishawl.com.